Our sunset balloon rides are back! Call for our discounts today! Our sunset balloon rides are back! Once again its that time of year! Our sunset balloon rides are back. The Senoran Desert Preserve has came to life during our monsoons, and the desert is beginning to cool. Many people that fly our sunset balloon flights and once the touchdown, and it is then they realize why we love our evening flights. From the beginning of November to the end of March, we offer our breath taking Sunset balloon rides. We meet at the Deer Valley airport, it is there you will be signed in and shuttled to your awaiting hot air balloon. There you will be your excited pilot and crew. As the crew begins to assemble your balloon, you will be greeted by your certified commercial balloon pilot with thousands of hours. He will do a quick safety briefing, and will stage you close by. The pilot will check the hot air balloon, to assure its integrity and then he will fire the burners. Once he adds the heat to the balloon envelope (colorful part), The balloon will breathe life! Once the balloon is stood up, the crew will assist in loading up the passengers and the balloon pilot and crew will do some lat minute checks. The pilot will let go of the tie off and up up and away you will go for your Sunset balloon ride over the beautiful, history rich Senoran Desert! After about an hour to an hour and a half balloon ride, the pilot will gently return the hot air balloon to earth and that will begin the Sunset Hors d’oeuvers. 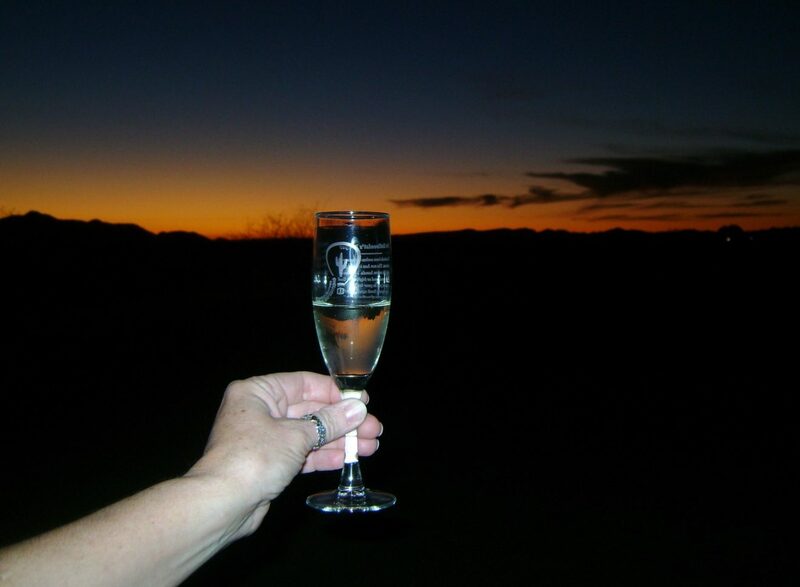 We literally set up linen tables and glass stemware in the Arizona desert and we watch the moon chase the sun over the Bradshaw Mountains! We light the candles and you will enjoy a romantic candle light meal. Truly finishing the memory of a lifetime. Once everyone is finished with their meal, the pilot with the champagne glasses held high, will speak the Balloonist Prayer and will award you are your guests the “de ascension en aerostatic” certificate. Now that you are in a family of balloonists, you will have the certificate to prove it! This is truly an amazing memory of a lifetime to share with your loved ones and our professionals. You will never forget the experience. Call us today and book your Sunset Balloon Ride in Arizona today! We have Balloon ride gift certificates available. Please forward this to someone planning on visiting Arizona! or fill our small balloon ride inquiry form out!